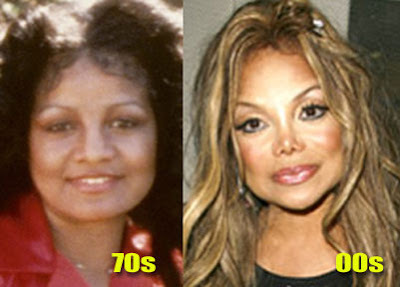 Latoya Jackson before and after plastic surgery. Yesterday we did a little feature on the talent Ms. Janet Jackson and her plastic surgery adventures. And today we bring to you a much more startling event, in which her much older and less talented sister , Latoya, pushed the limits of the plastic surgery realm. Latoya Jackson's over operated face is hands down, some of the worst celebrity plastic surgery results i have seen (maybe top 10), and perhaps the worst nose job thus far, its really that bad, folks. When you think about how much nose she had "removed", its simply shocking, and the finished result is....well, cartoon-ish. The frozen forehead leads me to believe that a brow lift was purchased at some point, and her lips have surely seen a few injection needles in their days. Nose jobs, collagen, botox and lifts, oh my! It'll be so funny when you might be writing about your own families botched up plastic surgery. She must use Michael's surgeon. Not good. Don't forget the chin!!! Plastic all over!!! and not looking good just strange. You would think with sooo much money in the Jackson family they could get Good Plastic surgeons. At least Janet looks reasonable. That's Rebbie Jackson her sister on the left stupid.